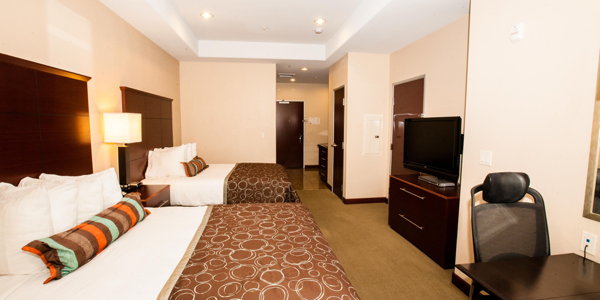 An Amazing Las Vegas Experience Characterized by urban sophistication, Staybridge Suites Las Vegas is the premier extended stay hotel, located just one-half mile from the Las Vegas Strip. The hotel's classic streamline design features rich wood and stone accents to please your senses with cosmopolitan style and a soothing ambiance. Enjoy breathtaking views of Las Vegas from each suite's private balcony. With a location right near the I-15, you can be anywhere in the city in about 15 minutes. We keep you connected while you work and play with free, high-speed Wi-Fi. Our friendly and free shuttle is ready to take you to McCarran International Airport or New York, New York on the Strip. You can see some of the most exciting attractions in the area from the floor-to-ceiling windows in the suite's living room! Get to know the predators of the deep up close at Mandalay Bay's Shark Reef, just one-half mile away. From the free, hot breakfast bar to the outdoor pool retreat with two whirlpools and free cabanas, you'll feel pampered at this Las Vegas, NV property. When you need to unwind, please join at the Social or work off your stress in the on-site Fitness Center. 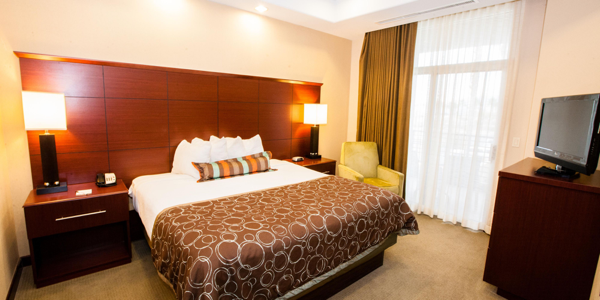 Your stay becomes an experience to remember when you are with us.